A heart is used to symbolize the emotion of love. Humans have long associated the feeling of love with the heart. The organ used to pump blood around the body. The symbol for Valentine's Day is a heart. A green heart is generally considered positive in that green is associated with growth and renewal. A love for nature. 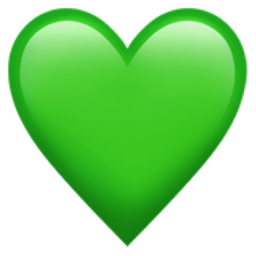 A green heart can also can be associated with envy, jealousy or possessive love. Green Heart possibly envious love or just looks cool. Hence the phrase, "green with envy."